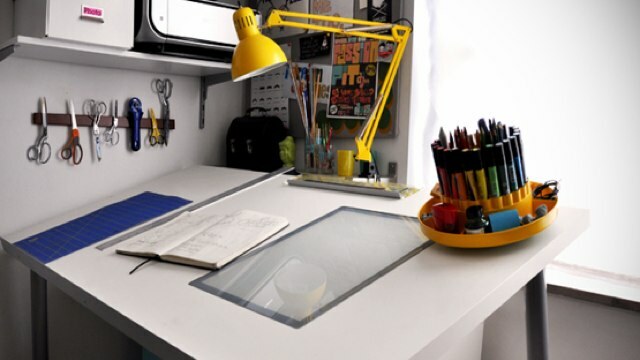 Drafting tables are great for writing, drawing, design, architecture, and other craftsmanship. DIY blog Curbly details how to make your own inexpensive drafting table from just about any desk. You'll need a flat desk surface (which can be anything, like a solid core door), adjustable- and desk-height table legs (you'll find both kinds at IKEA), assorted hardware, and tools like a drill, saw, and metal file to tackle this project. Once you're finished with this fairly straightforward project, you'll have a DIY drafting table that allows for an adjustable-angle workspace (nearly 45 degrees) that's more space-efficient and cheaper than many other options.